As they have occupied the corridor in the evening, this restaurant can caters up to 300 pax in a night. There are big, medium and small tables available. The head charge only covers all the food available and not the drinks, but you can actually order their homemade herbal drinks at only RM6 per jug. How can a good meal without some dipping sauces? Must try their homemade sambal belacan while you dine here, they are really good! One thing you must never forget when you have steamboat are those fragrant fried garlic in oil! This is definitely a must in every steamboat meal whether you are or you are not a health conscious person! As we were there really early, the staffs are still in the mid of bringing out all the fresh ingredients from the kitchen. As you can see on the wall, MingYuan Seafood Steamboat do have their own boats that went to the sea and bring in all the delicious and freshest seafood for all their customers. 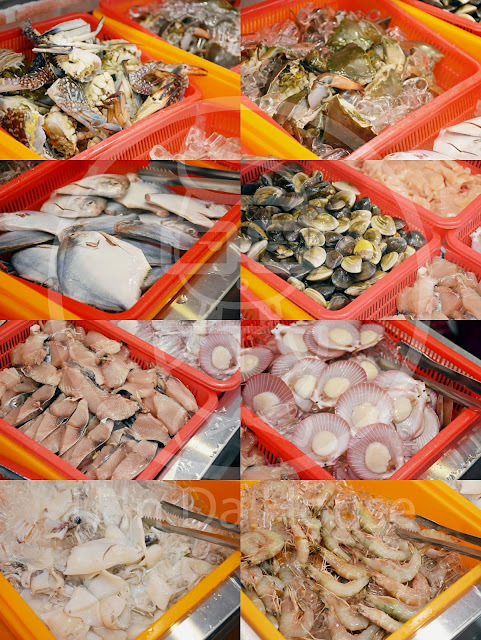 MingYuan Seafood Steamboat Buffet offers a wide array of ingredients for you to cook with your steamboat pot. From fresh vegetables to meats, noodles, fishballs and also fresh sliced meats. One of the best would be those thinly sliced pork. They are great to go with steamboat and also is is not the pork belly hence not so oily. Dipping it in the home made sambal was a bomb! Another of my favourites would be their homemade minced pork meat. I'm a big fan to minced pork whenever I dine in a steamboat restaurant. I still remember most restaurants in Penang are selling like RM5 - RM10 for a small plate of minced meat. I'm so glad that I can have it here as much as I want and I just gotta pay the head charge which is RM38.00 nett! Now we have all the fresh seafood for all the seafood lovers out there! 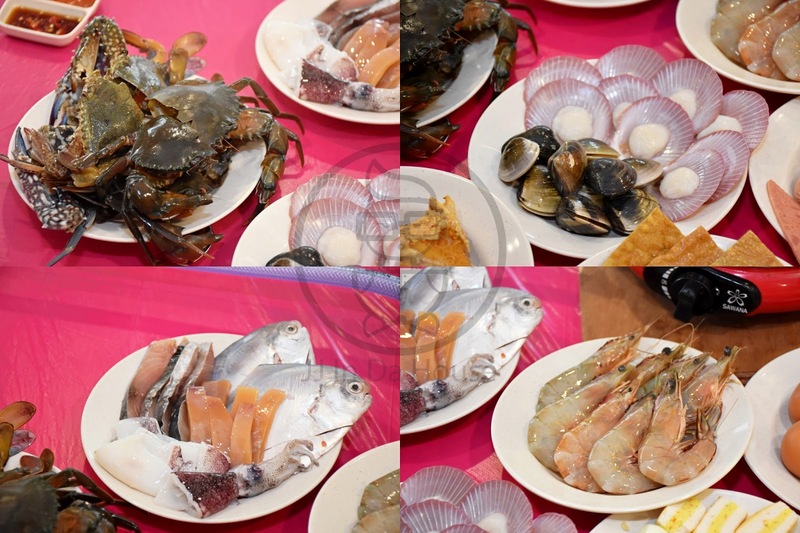 MingYuan Seafood Steamboat features their daily fresh catches like crab, squid, fishes and many more depending on what they can catch on that day. Some of the highlights would be flower crabs, meat crabs, scallops, fresh prawns(medium), fresh fish of the day and many more. We were told that if you are lucky, you can get to have some really expensive fish which you don't normally buy out there such as Sea Grouper(石斑鱼), Seabass and many more. Don't you just drool over all the varieties they could offer to all their customers? On a daily basis, MingYuan Seafood Steamboat will bring out special dishes such as fried fish head, fried chicken, or fried prawns depending on what they have on that day. We had the delicious and crispy fried fish head that went perfectly with the homemade sambal! This was our first round! Took a balance of almost all ingredients! Of course not going to miss all the fresh seafood! Look at how tempting they are! I alone had 3 crabs and numerous prawns! There are 2 types of soup selections in MingYuan Seafood Steamboat Buffet, which are the Clear Soup and White Tom Yum soup. The White Tom Yum soup is highly recommended. The soup got the right ratio of spiciness and sourness, rather appetizing and delicious I would say. As for those who don't fancy spicy stuff, I would recommend you to order the clear soup and do cook a lot of seafood, and you will really enjoy the sweet soup that cooked from all the freshest ingredients. MingYuan Seafood Steamboat gets quite crowded in the evening. I would suggest you to make bookings prior to your arrival date. We all dislike disappointments aren't we? Even though there were so many customers around, MingYuan Seafood Steamboat Buffet is really quick in replenishment as we observed. They replenish their ingredients real quick as the big crowd came in, unlike some buffet restaurants that could be quite stingy and would not want to replenish until customers ask. This is really one good selling point here in MingYuan Seafood Steamboat. Now all you seafood & steamboat lovers know where to go! Don't miss out this kind of steamboat buffet place that worth the money you pay. Address: 2-1-01, 1-Square, Jalan Tingkat Mahsuri 1, Bayan Baru, 11950, Penang, Malaysia.